The Director Principal of Government Medical College and Hospital Sector 32, Prof S.B.S. Mann, today put in his papers before the UT Administration. “I have resigned purely on personal grounds. Even as he saw his 15-year-old son being crushed to death by a truck, right before his eyes, Mr Virender Sakhuja of Ambala, had the heart to think of the visually impaired person who could get the “gift of vision” even though he had lost his son. The family of Abhishek Ahluwalia, along with the Shivalik Enclave Residents Welfare Association, will be presenting a memorandum to the UT Administrator, Justice O.P. Verma (retd), to seek strict action against the doctors and Inscol Hospital, due to whose alleged negligence, Abhishek’s one leg had to be amputated. About two lakh fixed-line subscribers of Bharat Sanchar Nigam Ltd in Chandigarh, Panchkula and SAS Nagar are waiting for the introduction of the new telephone numbers with prefix 2 to their current numbers. 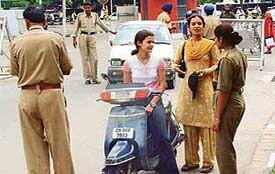 The new 11- digit number have been introduced in the country, except a few towns in the south and Chandigarh region. The Chandigarh UT employees transferred to the Municipal Corporation are likely to gain several benefits if the thinking in the Home Ministry is any indication. Over 7,000 employees who have been transferred to the corporation since 1994 would benefit by the proposed amendment to the Punjab Municipal Corporation Law Act. Parampal Singh Matharoo, the main accused in the murder of executive engineer V.K. Chopra, died here today after being brought to Government Rajindra Hospital from the Central Jail. Their love story ended in tragedy. Unable to make their respective families agree to their marriage, 26-year-old Jaswinder and 24-year-old Puja attempted suicide at their rented accommodation in Kalka this afternoon. While Jaswinder died, Puja was admitted to the hospital and saved. The formal allotment of sites in the Information Technology (IT) Park here is all set to commence from next week. The Chandigarh Administration has sought a clarification from its lawyer Mr Soli J. Sorabjee, on an order of the Supreme Court passed on August 11. The international general secretary of the Vishwa Hindu Parishad, Dr Praveen Bhai Togadia, may not be his fiery self during his visit to Chandigarh and Panchkula tomorrow. With terrorists posing a challenge to investigating agencies by using ever-improving techniques of using explosives, the Bureau of Police Research and Development has planned training programmes for the reorientation of officials of these agencies. The last radio contact with the pilot of the AN-12 aircraft which crashed in the upper reaches of Himachal Pradesh 35 years ago indicates that the aircraft was flying in zero-visibility conditions and it had strayed off-course, which may have led to the disaster. The UT Engineering Department today removed kundi connection from 90 temporary chambers in the District Court Complex here. A team of senior officials of the UT Engineering Department accompanied by a police posse marched in the district court premises in the afternoon and removed the kundi connections from the temporary chambers made on the first and second floors of the building of advocates’ chambers. Three more employees of the Municipal Corporation of Chandigarh, who were wanted by the Himachal Pradesh Police, today surrendered at Paonta Sahib in Himachal Pradesh. Two policemen posted in the township have been suspended on charges of illegally detaining a woman and trying to outrage her modesty. Taking a serious note of a written complaint by Rajinder Kaur (name changed), a resident of village Sohana here, the Superintendent of Police, Mr Harcharan Singh Bhullar has ordered immediate arrest and suspension of Dilbagh Singh and Shamsher Singh, both constables. A 22-year-old woman has accused her husband of cheating her by hiding the facts of his first marriage from her. The two had been involved for the past 10 years before they decided to tie the knot. 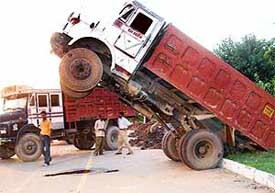 Three persons were injured, two of them seriously, when the vehicles they were driving collided head on the busy Kalka-Ambala highway here last night. Two of the injured have been identified as Sudhir Kumar and Randhir Singh. The body of Puna, an 18-year-old girl of Maloya colony, was found by her family members along the railway track in Panchkula last night. Later, they brought it to their house and informed the police. “A nexus between publishing houses and red-tapism prevented the Central Board for Secondary Education from introducing a revised syllabus in accountancy which has been long overdue,” said Dr Balbir Singh, Chairperson, Department of Business Studies, Delhi University. Even after about two months of commencement of the fifth semester, the students of Panjab University’s Law Department are struggling to get faculty for three major subjects. The police checking at the Punjab University gates opposite Sector 15 and Sector 25, respectively, coupled with closing of the gate opposite PGI has created a resentment among daily visitors to the campus. Visitors to the Panjab University campus face inconvenience as cops verify their antecedents before allowing them entry on the campus. This picture was taken on Saturday at Gate No. 2. A Biotechnology Festival-COSMID-2003 was organised by the Department of Biotechnology at GGDSD College, Sector 32, here yesterday. The festival, inaugurated by Principal of the college Dr. A.C. Vaid, was marked by lecturers by eminent scientists, inter-college quiz contest, group-discussions among others. The Principal, College of Communication and Management, Bhartiya Vidya Bhavan, Dr P. K. Vasudeva, was given the Bharat Jyoti Award by Dr Bhisham Narain Singh, former Governor Tamil Nadu at a function at Hotel Cannaught, New Delhi. A two-day annual talent search competition, “Aurora” organised by students of the Guru Gobind Singh College for Women concluded here today. About 100 students from 50 government and public schools of the city participated in an essay writing contest held at the CII Northern Region Headquarters here today. Lions Club International( Region IV) today organised a seminar on anti dowry and a peace poster contest at Manav Mangal High School, Sector 21C. As many as 50 students participated in the poster competition. Students laid stress on the need to save the earth from war. Taking up a criminal complaint case by a Chandigarh resident Ms Baljit Kaur, a local court has ordered the summoning of the former Punjab Speaker, Mr Ravi Inder Singh, Ms Rajmohinder Kaur and Mr Gurdev Singh for December 2. Thirty-four members of the Army Wives Welfare Association donated blood at a camp organised today at Command Hospital, Chandimandir, near here, to mark the association’s 38th anniversary. 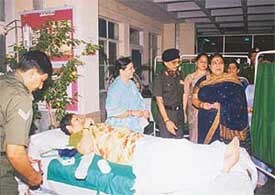 A blood donation camp was organised by the Army Wives Welfare Association at Command Hospital to mark its 38th anniversary in Chandimandir on Saturday. More than 100 students donated blood at a camp organised by the Himachal Pradesh Students Union in memory of Capt Vikram Batra, Param Vir Chakra, at Panjab University. A former PGI physician and cardiologist, Dr J.S. Chadha, was invited by the Department of Correspondence Studies, Panjab University, to deliver a talk on positive health. St Stephen’s School, Sector 45, and Sacred Heart Senior Secondary School, Sector 26, won their respective matches to sail into the last four of the first Chandigarh sub-junior girls football championship being played at Shivalik Public School, Sector 41, here. Income Tax assessees who hide their income, especially “other” sources of income while filing their returns, should be ready for penalty and imprisonment, said Mr Raj Narain, Member of the Settlement Commission of the Income Tax Department, here today.